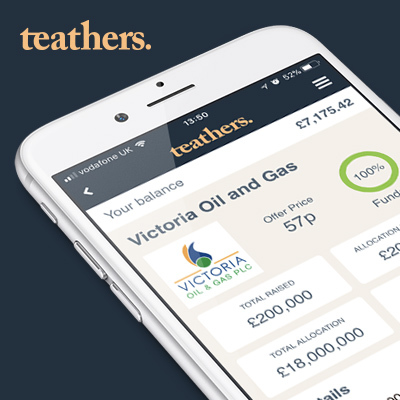 A total of £200,000 worth of new ordinary shares in Victoria Oil & Gas priced at 57p per share are being made available to onboarded users of the Teathers App. The deal will be open from 0800 Thursday 26 October 2017 until 1630 on Friday 10 November 2017. Applications will be served on a first come first serve basis until such point as the allocation is fully taken. Please note this Proposed Placing is subject to shareholder approval at a General Meeting of the Company on 13 November 2017. Assuming shareholder approval is given for the Proposed Placing, admission is expected to occur by 0800 on 14 November 2017. Victoria Oil & Gas Plc (“VOG” or “the Company”), the integrated natural gas producing utility in Cameroon, has been made aware of very recent market speculation regarding the Company undertaking a potential fundraise and the Board confirms that VOG had been in advanced discussions, with a number of investors, regarding a possible placing in order to fund the Company’s operational development and working capital. That fundraising structure has now been converted from a traditional placing structure to the accelerated book build process detailed in this announcement. The Company is seeking to raise between US$20 million to US$26 million by way of the Placing and Subscription through the issue of new Ordinary Shares at a minimum price of 57 pence. The Company is also proposing to raise up to US$3.0 million by way of the Open Offer which will be available to all Qualifying Shareholders on the Record Date. The Fundraising comprises the Placing and Subscription and the Open Offer. A circular will be published setting out the full details, terms and conditions and timetable of the Open Offer. Further details of the Placing are set out in the appendix in the RNS, dated 25 October 2017, linked below. Having established a natural gas supply business in Douala, VOG believes that the net proceeds of the fundraising, together with additional capital intended to be sourced from local banks will allow the Company to accelerate growth in gas production to meet the opportunity that exists in the Cameroon power sector. Extend pipeline reach around port city of Douala to Bomono, the Eastern Corridor and other specific customers. Shore Capital Stockbrokers Limited (“Shore Capital“) and FirstEnergy Capital LLP (“GMP FirstEnergy“) have been appointed as joint bookrunners (together the “Joint Bookrunners“) in respect of the Placing. Strand Hanson Limited is acting as nominated adviser to the Company. The Placing is conditional upon the passing of Resolutions relating to the Placing and Subscription which are to be proposed at a General Meeting of the Company. A circular is expected to be posted by close of business on 26 October 2017 (the “Circular“) notifying shareholders of a general meeting for the purpose of considering the relevant resolutions. This Announcement contains inside information for the purposes of Article 7 of EU Regulation 596/2014 (“MAR“). In addition, market soundings (as defined in MAR) were taken in respect of the Placing with the result that certain persons became aware of inside information (as defined in MAR), as permitted by MAR. This inside information is set out in this Announcement. Therefore, those persons that received inside information in a market sounding are no longer in possession of such inside information relating to the Company and its securities. Additional information on the Fundraising is included in the linked RNS below, dated 25 October 2016. Attention is also drawn to the section headed ‘Important Notice’ and to the Appendix to this Announcement containing, inter alia, the terms and conditions of the Placing (representing important information for Placees only). The number of Placing Shares to be issued in connection with the Placing will be determined by GMP FirstEnergy and Shore Capital at the close of the Bookbuild process, and the results of the Placing will be announced as soon as practicable thereafter. The timing of the closing of the book, pricing and allocations is at the absolute discretion of GMP FirstEnergy and Shore Capital. Sam Metcalfe, the Company’s Subsurface Manager has reviewed and approved the technical information contained in this announcement.